The Deuce is easy to fly, quick and responsive on the controls, gentle to land, and even gentler to land with flaps. It has a respectable cruise of 110 mph, plenty fast for an open cockpit airplane. The charm of the Deuce is low, slow, and uncomplicated - in harmony with the pure pleasures of basic, simple flight - no cowl vents, no retractable gear, no constant speed prop. Is this a step back into time? Oh, I don't think so. Maybe it's just a step back into the real world. A return to fundamentals, simple flight without being first, best, fastest, best radios, stormscopes and turbochargers. Just pure flight as it first was. Open cockpit flying brings back meaning to warm summer afternoons or autumn, when the leaves have turned - crossing the country side - smelling the crops and fields of green, and enjoying the sheer pleasure of free flight. See something you're curious about? Investigate it with a gentle turn and fly by. Is there a lake behind that ridge, gently bank and go see. You know, you can see forever from an open cockpit. We are planning a long term, wonderful future for this gentle flyer. Our goal and purpose is to help you, in every way possible, to build one of these unique, treasured craft so you may realize your dream of building and flying your own personal airplane. 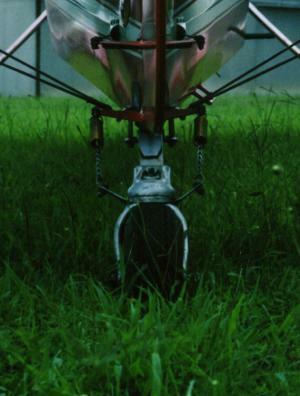 The Bakeng Deuce was designed by the well known Boeing aeronautical engineer Jerry Bakeng. The first aircraft was featured in the May 1971 issue of Sport Aviation (cover photo shown at right). 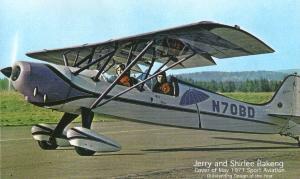 That year the aircraft was also awarded the Outstanding Design Trophy at the annual EAA fly-in in Oshkosh, Wisconsin.